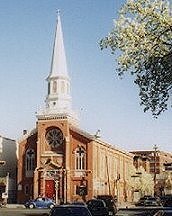 St. Stephan's German United Evangelical Church was organized on March 17, 1874. The cornerstone of the church was laid on June 25, 1874 and completed in December, 1874. Most of the charter members had come from the Third German Presbyterian Church, led by Rev. Oscar Kraft. Rev. Kraft was of Lutheran background while the Presbyterians of the Third German Presbyterian Church were from a Reformed background. This caused a problem for the congregation and after a short time the congregation split into the two factions. The members with a Lutheran background (three-quarters of the congregation) followed Rev. Kraft to the new church, St. Stephan's. The first meetings of the new church were held in Reichert's Carpentry Shop on Merchant Street. Pastor Fuhrmann was born in St. Petersburg, Russia and attended a seminary in St. Louis, MO. He was a well respected community leader. His services as a mediator were used in labor disputes at the local breweries where many Germans worked (including my family). Services were still being held in the German language until 1960. Gives relief to its own destitute members and in instances to nonmembers. Maintains the Heathen Mission of the German Evangelical Synod of North America in the East Indies, and the Home Mission of the same Synod. Dramatical plays in German language are taught under the auspices of the church. Church in not open. Records of Baptisms, Marriages, Members, and Deaths are in the custody of the Church.